Deep within the mountains at the edge of civilisation, Kingsvale was built to take advantage of the semi-precious metals and gemstones found in abundance under its surface. Twice yearly, a caravan is taken up the mountain path with foodstuffs and other goods the residents find hard to produce, to return laden with the smelted metals and gems extracted from Kingsvale’s many mines. The people of Kingsvale are welcoming and unprejudiced, focused on surviving and prospering in their perilous surroundings regardless of racial or societal differences. Humans, dwarves and elves all have a hand in ensuring Kingsvale continues to thrive in these difficult conditions. The mountain’s surrounding Kingsvale are ancient and vast, home to many dangerous creatures suited to the freezing cold environs that exist throughout the area. Beyond the mountains lie The Frozen Wastes, a harsh and unforgiving landscape known for the roving tribes of savage ice trolls that inhabit its snowy plains. Besides the various dangerous creatures found in its vicinity, Kingsvale is also known for the abundance of tombs, shrines and ruins uncovered in both it’s mining operations and the continued mapping of the surrounding mountain paths. These monuments of ages past are often littered with traps and guardians requiring brave (or foolhardy) adventurers to recover the lost knowledge and items contained within. One such location adventurers could find themselves in is the tomb of Drakthar, the conjurer. This tomb is actually a custom demiplane accessible through a pair of old metal doors recently uncovered in the mines of Kingsvale. The tomb’s entrance hall is revealed by a soft blue light pervading it’s interior. This large room is entirely carved of ice including the pillars, a fountain and a grand, sweeping staircase that are fitted within. A thin veil of frost coats the entirety of the room and the fountain lies dry, with a sheet of old, dried blood obscuring it’s bottom. Upon stepping into the room the light begins to fade, leaving but a single mysterious source of light seen vaguely through the pillars. The last chamber is a quaint combined bedroom and study with various bookshelves, desks, and a stone sarcophagus in place of the bed. Magical effects, items and ancient pieces of lore scatter this once prominent wizard’s final resting place which will help the party in their further adventures. Congratulations, Jaimee. Putting yourself out there to compete in anything is hard, and designing RPGs is hard. Particularly designing adventure settings or locations. You have to be able to suggest some ideas about personalities, plots, terrain, and more, and have GMs chomping at the bit to add your location to their regular game. Let's see how you did! I believe in positive feedback and honest criticism that should make you better at every part of this gig. So to start positively, I want to say thanks for having a larger setting outside the scope of your map. Your overview of Kingsvale gives me a place to set an adventure in, easily referenced threats, and and overall purpose and attitude for its people.Now I have enough information to describe the area to the PCs on their way in and out of the location. This is important in encounter and adventure planning. I have used the word immersion a lot and you can't have too much. I challenge you to go a little deeper in your thinking to help provide that immersion. The elves, dwarves, and humans all get along with no conflict? We need to make that less boring. Either there is some racial tension as the races do their job and rely on the other races to do theres (the humans wish the longlived elves had more urgency, while the dwarves are perfectionists demanding quality work over long hours), or we need their unity to be the result of something. The harsh climate and dangerous threats forge bonds that make the different cultures one united family. Something along those lines. I am the absolute worst visual artist of all time so I am slow to criticize a simple map idea. However I have a couple of comments. First, the map really is very very simple. Use your draft of maps to communicate things to the cartographer. Draw in a sarcophagus and maybe damage one of the pillars or include a shrine. Cartographers are artists and they are going to be paid by a publisher to make your map compelling. Hep them out. Overall a strong entry. Make sure you (and the other contestants) look at a few Pathfinder products to see how mechanical information is formatted and give us those elements so we can see how you'd submit for a publisher. Good luck in this contest! This adventure location starts with a comprehensive overview of the surrounding area. You present environmental and creature threats in the region that PCs may encounter as they travel around Kingsvale. My quibble is the adventure location is actually Drakthar’s Tomb, rather than Kingsvale. That turns out to be a cosmetic issue, since you avoided the trap a couple of others have fallen into, and you describe the tomb as an adventure location instead of providing a map without context. You provide a terrific description of Drakthar’s Tomb, and I can imagine how it would look. The tomb itself has guardians that hold to the location’s theme. I wish you would have spent a sentence telling the reader who Drakthar was, since this location holds some significance. The map clearly conveys the tomb’s layout. You show all the major features in the larger chamber, but I would have liked seeing some of the features in the wizard’s bedchamber to get a better understanding of its layout. A cartographer would have to either ask for specific details or embellish those details on his or her own. Your text is relatively clean. I noticed a couple of instances of passive voice (for example, you could reword “a caravan is taken up the mountain path…” as “a caravan travels up the mountain path…” to show the caravan taking a more active role in the sentence). You have a couple of instances where you use “it’s” rather than “its” (I see a couple of places where you have the correct usage, though). Overall, the central region of Kingsvale and the focal location of Drakthar’s Tomb combine into great adventuring locations. There are a couple of omissions in the text that detracted from this location’s allure, and the map could have been more comprehensive with a couple of minor additions. These concerns reduce this to a weak recommendation from me. I'm afraid I find this entry a little confusing. It's titled Kingsvale, so I'm expecting it to be about someplace called Kingsvale, and it indeed starts off that way. The first couple paragraphs paint the picture of what seems to be a rather idyllic village but in this case the lack of any apparent conflict means it's probably not going to be the most exciting place for adventurers to go. The entry then goes beyond the village, describing its environs and then finally a tomb uncovered by the miners. So while there is a link between Drakthar the conjurer's tomb and Kingsvale, I don't think I'd really say the former is part of the latter. It's unfortunately all a bit disjointed for me. (There are also a couple writing issues that leapt out at me -- Mike pointed out it's vs. its, but there's also "mountain's" when there's no apostrophe needed.) The entry describes the tomb well, but there's no real history about Drakthar, which I think would have given us a little more connection to this location. That name kind of makes me think evil, but then it mentions "quaint" bedroom/study, which leads me away evil and doesn't really put me in the frame of mind of adventure. The map itself is, I'm afraid, too simple. It's three simple rectangular rooms, and while the first has some columns and a neat stairway, there's just not that much to it, even though it's an entire demiplane. There's a lot of unused space at the top of the map to either sides of the bedchamber that could have been used to add some other interesting features for this tomb. Even in that bedchamber, the text indicates that it's full of stuff, but none of that is apparent on the map, meaning the cartographer would have to decide where it all goes or the developer would have to be in touch to make sure it fits what the adventure calls for. I'm sorry to say that based on all of this I do not recommend this for advancement. Congratulations on making it through Round 2. First, from the standpoint of submitting this to the publishing cartographer, there are some issues, as other have pointed out. I don't like to pile on such obvious things, but like the others, you've failed to accurately portray the layout of objects in some rooms where you've indicated that there's significant things. 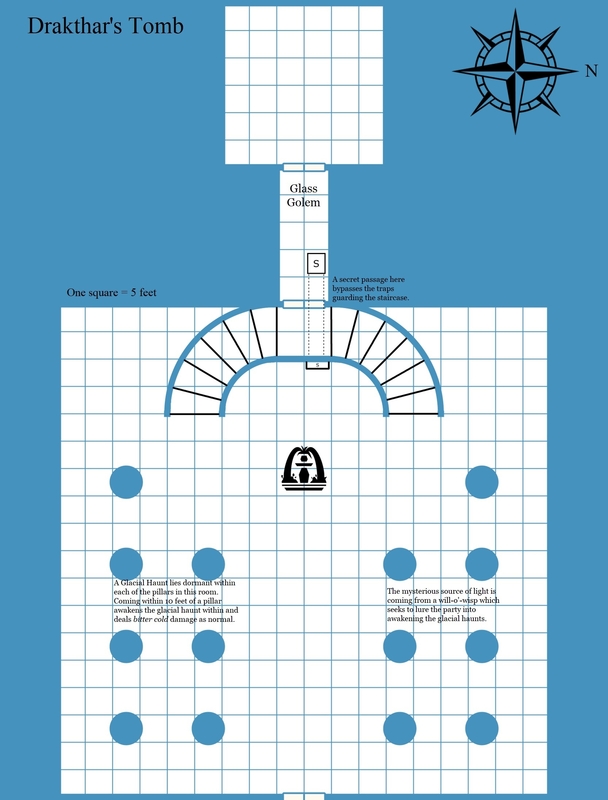 The large, main room is well-laid out and mapped, but the rest is rather barren. Second, from an exciting location standpoint, I think this fits. You've got pillars with their own nebulous dangers (not sure what 'bitter cold as normal' is meant to mean, maybe just, really cold or a lot of cold damage), you've got a somehow trapped staircase, you've got a golem and wisp, and there's a secret passage. This means I can have an encounter with the PCs raiding the tomb (as normal), or being driven into it by creatures and having to defend it. At its base, this map is a very simple location. It's three rooms with a staircase and a fountain and pillars. I can easily put something together using this layout for (very short) dungeon crawl. Like motteditor mentioned, you've left a lot of unused blue-space to either side of the end room. You could have placed storerooms off the main room there, or had the staircase in the main chamber go up in a corner of the room rather than keeping things symmetrical and then had a few challenging or linked chambers running east to west to reach the end room. There was a lot of unused potential left on the table, in my opinion. Unlike most, it seems, I care little for overarching and expansive details of surrounding when they have little bearing on the map location or what might happen there itself. I would rather know more about the map location. Specifically in this case, none of the details on Kingsvale necessarily give me anything to help with this map (other than if I have snow or ice trolls chase the PCs into it). This entry could have just been labeled Drakthar's Tomb, not Kingsvale, and the entire history could have been about Drakthar or the tomb's builder and its purpose and existence. Knowing there's elves, dwarves, and humans in the area is of no purpose to me since I don't know Drakthar's origin or whether this tomb was built by any of those races, so I don't even know if I can describe any room or pillar as 'dwarven style' or whatever. Not to belabor the point, but why should I care about a bi-annual caraven to Kingsvale or the fact that there are tribes of ice trolls in the Frozen Wastes? Especially when those wastes are beyond the mountains where this location is... which are outside of Kingsvale... and Kingsvale has no actual connection to this tomb other than it's the closest settlement? The fact that it's a contained demiplane is fine, but that just further reinforces that I can drop this anywhere I want, even in a desert or inside a floating cloud and that makes the icy interior just fine. I don't need Kingsvale or its history at all. Use that space for improving and detailing the map and location and just say the tomb is 'X miles from the nearest civilized settlement [in the mountains/in the desert/beneath an old cemetary/etc.]'. Also, the fact that the tomb is made of ice is cool and all, but the map takes no real advantage of this. Certainly the GM can determine the temperature and the effects of cold damage, but other than the staircase (and presumably the secret passage) which might be difficult to climb, the layout doesn't take advantage of this unique feature (everything is covered with frost, so unlike 'wet' ice, it probably isn't unduly slippery unless really running or if it gets wet), but there's no other slopes and even the fountain is dry so there's no chance of the floor getting wet or slippery. It's no different than a dungeon of stone other than cosmetically (unless the PCs purposefully start fireballing everything). Put slippery slopes in the hallway to make the PCs slip and slide as they try and advance on the glass golem (and give it a way to attack them as they try, even if it's just rolling sharp and melting balls of ice down the slope at them). Put turns and twists with icicle spikes jutting from the walls so a rushing PC that fails an Acrobatics check while moving on the ice slips and slides right into them. Make the map evoke images of interesting tactics and things that could happen other than hide-and-seek with a will-o-wisp amidst ice pillars.